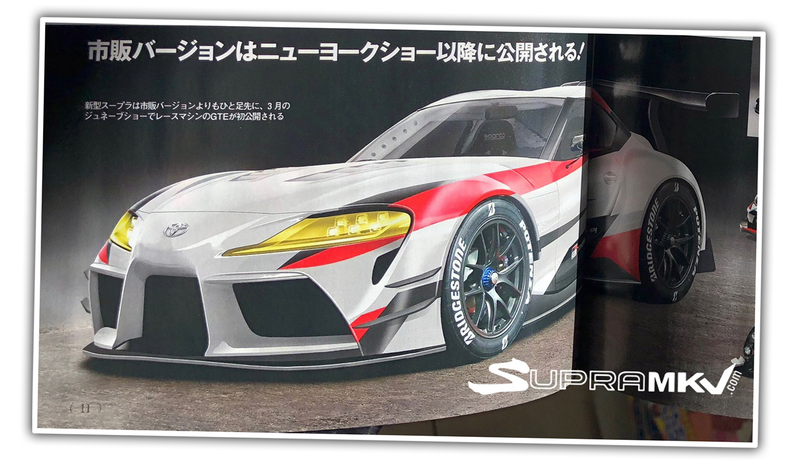 A Japanese magazine seems to have published a two-page spread of what looks like the new Toyota Supra, done up in the livery of its Gazoo Racing arm. It’s hard to say if this is legit at this point! We still haven’t seen the real Supra yet, but it’s existed in mule and leak form for so long we basically know what it really looks like. Technically, this image seems to be of Toyota’s “Racing Concept” which is scheduled to be shown at the Geneva Motor Show next month, and has been strongly hinted by Toyota that the Racing Concept will foreshadow the look of their soon-to-be-reborn Supra. It’s not absolutely clear if the magazine’s image is a nicely-done render or an actual photo, but the looks seems to fit with what we’ve seen on test vehicles. To recap, the new Supra developed by Toyota as a joint venture with BMW, and its guts underpin the new Z4 roadster as well. It’s speculated to have a twin-turbo inline-six engine, something like 335 horsepower, an eight-speed automatic (a manual seems to be a maybe) and should weigh something like 3,284 pounds. It’s a car that car-dom has been waiting for for years, and supposedly we’ll see it for real soon. I do hope the yellow headlights make it into the production version, so every night drive can feel like a trip through Paris in the 1970s.